Question:I am reading a PDF file in small applications, I hope I can increase PDF font size to make it better for reading. Is there any solution on VeryPDF? Answer: There are two situations, if your PDF is text based PDF, you can increase PDF font size by VeryPDF PDF Editor easily. But if your PDF is image based PDF file, for now there is no good tool for increasing PDF font size directly. Maybe you can try to convert image PDF to searchable PDF file and then adjust PDF font size. 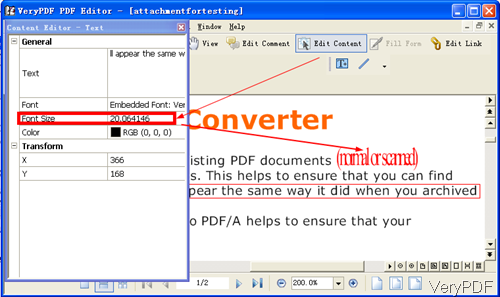 In this article, I will show you how to increase PDF font size of text based PDF file. Please pay more attention to our website, I will publish article about how to increase PDF font size of image based PDF file. VeryPDF PDF Editor is an application which can be used to edit text, hyperlinks and other elements of PDF, and add comments and annotations to PDF. And all the VeryPDF software is free download, so you can install this software and test it without any fee produced. When downloading finishes, there will be an exe file. Please install this software by double clicking the exe and following installation message. When installation finishes, there will be icon on desktop, simply click it then you can launch this software. Step 2. Increase PDF font size by PDF Editor. Please click short icon on desktop then you launch this software. Click button Open you can add PDF file to software interface. When adding finishes, all the PDF page will be shown here. When you need to increase PDF font size, please click button Edit Content and you can draw lines to frame the whole page or some area where you need to increase PDF font size like I showed in the following snapshot. Then right click the red frame around the text, there will be dropdown list, please choose Properties menu option, you will see menu option like I shown in above snapshot. Here you can edit text content, font style, font size, font color and font position. In the font size part, please input the font size value you need to increase PDF font size, then the font size will be changed at once. This method can be used to the whole page, the whole PDF, simply frame the whole page or the whole PDF file. When you finish editing, please click option File then Save as. Then you can save changes to PDF file. 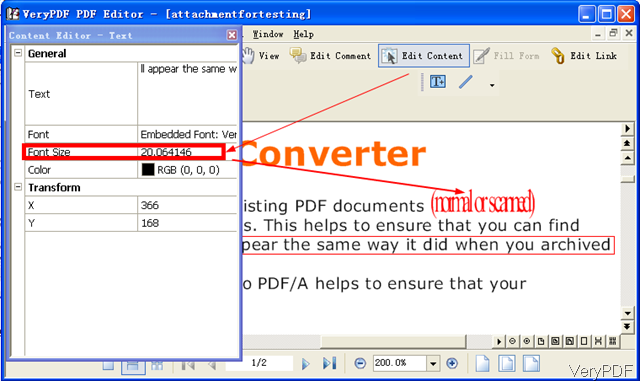 By this software, this method, you can increase PDF font size easily. Please note again, this way is only for text based PDF file. During the using, if you have any question, please contact us as soon as possible. How to convert pxl to jpeg via command line? This entry was posted in PDF Editor and tagged increase PDF font size. Bookmark the permalink.